If you were to look under the layers of facial tissue, you would see bundles of thin threads. These threaded bundles of muscle are attached to your skeletal frame on one end and integrate themselves into your facial tissue along their entire extent. The support system holds your entire facial structure together and makes you look like “you”. Facial-Flex® has been proven effective in clinical studies, with results published in the Journal of the Society of Investigative Dermatology and The Journal of Geriatric Dermatology. Dr. Albert Kligman, an often quoted research dermatologist at the University of Pennsylvania, has stated that “facial sagging cannot be pharmacologically corrected”. This means that there is no cream or lotion that you can apply to your face that will restore its shape once it starts to sag. Not only that, there is no cream or lotion that will prevent facial sagging. 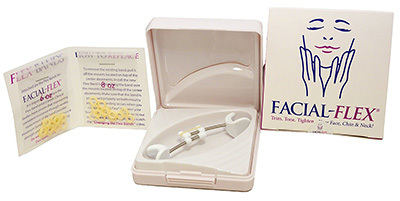 Because Facial-Flex® works from the inside out, when you use Facial-Flex®, you restore and maintain the original shape and contour of your facial muscles. It is these muscles, combined with your skeletal structure, that largely determine the way you look naturally. The results with Facial-Flex® that you achieve will depend upon your age, general health, and the existing condition of your underlying facial musculature. Research has shown that muscles not exercised against resistance lose their strength, shape and tone. Except during changes in facial expression. 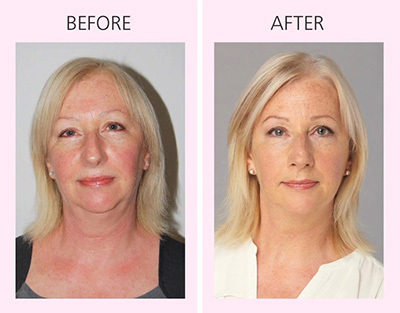 “I noticed my jaw line and chin were beginning to look droopy. After using Facial-Flex, I was surprised how much firmer my jaw line, neck and overall facial muscles appeared. I’m convinced Facial-Flex has made a definite improvement in my facial muscles and I am continuing to use it.” Dr. Mary T.
“I have been using the Facial-Flex for about 4 years, and I cannot say enough about its results. I just love it! ….. P.S. I try to tell everyone about the Facial-Flex, but sometimes it’s just too GOOD a beauty secret to spread around!” Rhonda H.
“After about three weeks of using Facial-Flex® , I see a completely symmetrical mouth in the mirror, and a new, younger-looking, definition to my cheekbones………Thank you for an excellent product that gives the user the satisfaction of results as promised. I feel so much better about my aging face!” Adele A. “Before I was about to have a face lift, I wanted to give Facial-Flex® a try. After only 4 and 1/2 months of using your Facial-Flex instrument, I no longer need to have this operation. I have taken away 10 years off my age on my face and neck! Your “instrument” worked so well I will recommend it to anyone who is even thinking of a face lift. I cannot begin to thank you enough.” John M.